HOW COOL! 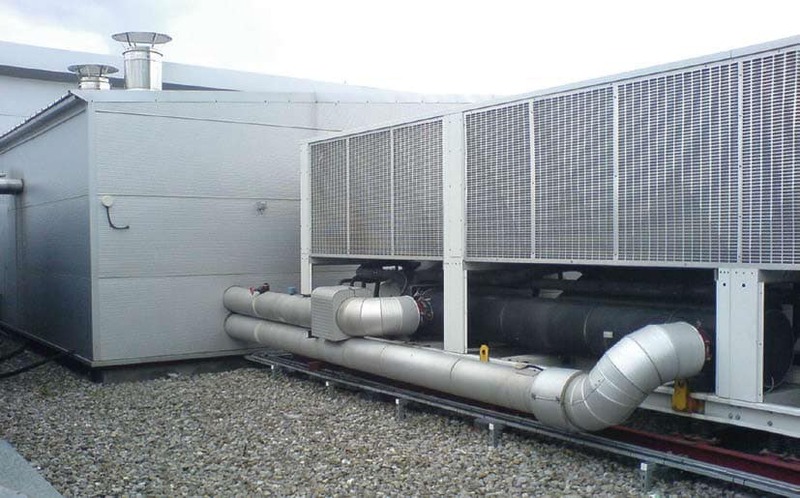 – The figure shows the boiler and the chiller which supply hot and cold water to the Air Handling Unit to heat and cool the air. We all know that maintaining a great brand image for cinemas is essential. Visitor comfort plays a large part in this. In fact, no-one wants to overheat or sit in a draught, both sure-fire ways to reduce attendance. So why is air-conditioning in cinemas so important, and what is the key to getting it right? The cinema environment is quite unlike any other. Patrons remain static for long periods of time. They are therefore more likely to notice changes in temperature. Moreover, cinema auditoria can be big spaces. This may mean there are large temperature differentials between ceiling and floor. Add to this the fact that some patrons may be wearing layered clothing while others just T-shirts and shorts… It is not difficult to see the challenges. So it makes sense for exhibitors to outsource the management of their heating, ventilation and air-conditioning (HVAC) to external specialist contractors. In turn, they will benefit from a system that is properly-maintained, achieves maximum energy- and cost-savings. This allows cinema staff to focus on their main job responsibilities. There needs to be air movement within the auditorium, giving the temperature every chance to circulate. Infact this reduces the number of potential hot or cold spots. The temperature sensors, which control the air-conditioning, ensure the correct flow of air movement. So it is vital these are strategically-positioned at various heights within each auditorium to facilitate this. Internal temperatures should be relatively cool in winter. This may be surprising to hear but, in winter, movie-goers often wear more layers. So patrons may overheat if the temperature setting is too high. Additionally, you should controll each of the cinema’s auditoria automatically, in accordance with changing screen-times. This is achieved using BACnetTM protocols over a corporate Wide Area Network on standard IT equipment. This technology can be used to connect to, and remotely monitor, cinemas across the country from a central service bureau. This means trained engineers can monitor and control the individual cinema environments as well as diagnose faults when necessary. To take full advantage of the bureau service, exhibitors submit a weekly Occupancy Table* to bureau technicians for each theatre. This lists the screenings for the coming week. This way, technicians can programme the building controls for each screen, also the public areas. As energy consumption is correlated to fluctuating occupancy levels, the system uses valuable energy only when necessary, without waste on unoccupied space. Conventional air-conditioning systems usually only permit onsite managers to make local adjustments to temperature settings. So, when there is need for more warmth, the tendency can be to increase the set-point from, say, 21°C to 29°C in an attempt to heat the area quickly. When, inevitably, this becomes too hot, the temperature is then readjusted back down again. But in order to revert to 21°C, the system switches off the heating system and begins pumping in fresh air. As well as being an inefficient use of energy, this invariably causes seated patrons to experience unwelcome draughts. By contrast, the system needs to offer centralised control from the remote bureau. This has two advantages: it eliminates the need for inefficient local user adjustment. Moreover, it ensures temperatures can be both varied and properly-controlled at all times. What is more, if a problem does occur, cinemas need make just one call to the bureau. Infact it can quickly rectify it without further input from cinema staff. You can also save energy via optimum Start/Stop programming strategies. It means that the heating plant begins just in time to get the building up to the right temperature. It then falls gradually, and imperceptibly, well before occupancy comes to an end. Similarly, you can program the system to switch off for a couple of hours during the middle of the day. The inertia of the building fabric will contain the warmth. This way, temperature drops won’t be noticeable. The owner obtains further energy- and cost-savings. Such strategies go above and beyond the thermostat- control found in typical building management systems. Moreover, they could potentially save cinemas £10,000 annually in electricity consumption alone. Jesse Hughes, of the Eagles of Death Metal: "I miss the Drive-in"
Properly-controlled air-conditioning systems also require less frequent maintenance and thus cost less to run. This is because mechanical plant equipment like fans, pumps and condensers don’t need to work so hard. The result is reduction of wear-and-tear and maintenance costs. In summary, customer comfort should always be top priority. But people can enjoy added commercial benefits through fully-automated air-conditioning systems with energy- saving control strategies. 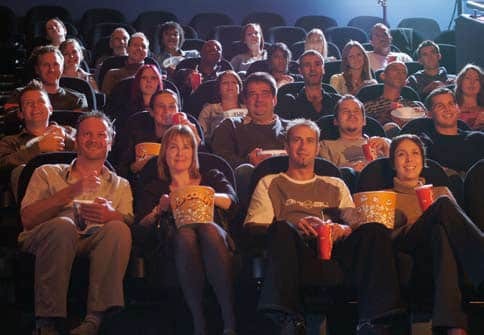 A majority of cinemas already use BMS (Building Management Systems). It is important that they are used proactively i.e. achieved through prior implementation of tailored building control strategies. To gain maximum benefit from such use, you should connect the BMS back to a remote bureau, to program and manage it. To do this, you need to install a high-speed line from the cinema to the bureau. This line, irrespective of the cinema’s screencount, costs iro £2,000. From here, annual costs are less than £3,000. In terms of the energy savings that proactive use of the system generates, the payback period (including initial set-up) is typically under a year. *A Cinema Occupancy Table ensures that you can program the system. This way, the system will use energy only in the actually occupied screens. Hence you can heat the cinema just in time for the arrival of visitors. You can also switch it off approximately half-an-hour before they leave.